In April of 1922 came “a friendly letter from Mr. Vose [his Boston dealer] enclosing a check in the amount of $600 for a painting, [which] afforded a bit of much needed relief and encouragement.” Unfortunately, Albert did not live to see the continued success and renewed appreciation for his subtle paintings that was to come about following his death. 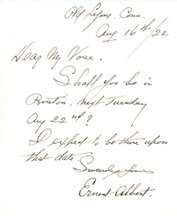 The Vose family was fortunate enough to have handled some of Ernest Albert’s paintings during his lifetime, leaving our archives full of correspondences in the forms of telegraphs and letters. Following his death in 1946, Albert’s family gathered together all of his works and kept them out of the public eye for nearly thirty-five years. While conducting a private appraisal in Lexington, Massachusetts in 1979, Robert C. Vose Jr. uncovered a spectacular winter scene with a mill and frozen pond painted by Albert. After heartily singing the painting’s praises, he heard word from the owner that there was a barn full of Albert’s paintings in the family collection somewhere in Connecticut. As the artist’s dealer in Boston during his lifetime it seemed natural that Vose would again represent Ernest Albert, and his subtle paintings evoked much public enthusiasm during Vose Galleries’ first exhibition in 1981, and later again in 1982 and 1986.